Keep your horse busy and entertained for hours. 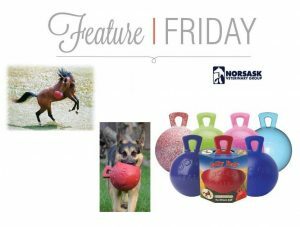 No matter how rough your horse plays – the Jolly Ball can take it! Made of tough polyethylene to resist deflating from biting, stepping on, or kicking. Jolly Balls do not need air – won’t lose shape or flatten. Makes a great gift for your horse that you’ll both enjoy! You’ll love watching your horse have so much fun, and your horse will be thrilled with the new toy and exercise! These Jolly Balls are perfect for large breed dogs; they can carry them around and chase after them. To order these online head to our online shopping section, click here.